Showing 23 articles from October 20, 2014. 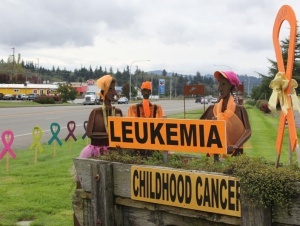 Residents have decorated sections of Raymond bringing attention to Cancer Awareness Month. Looking at how communities rally around a good cause, most starting from a simple local awareness gathering shows just how effective a grassroots movement can be. At Monday night's Raymond City Council meeting the Mayor's chair sat empty as the council conducted business for the first time after the recent resignation of Mayor Bob Jungar. 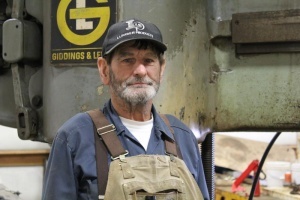 Ted Norman of Ted's Repair and Machine is looking to slow down a little as he prepares to move out of the Port of Willapa Harbor and take care of his own projects from his Raymond home. Pacific County is starting to see some of the benefits of the new green industry, marijuana. Winlock and Toledo high schools will be holding open enrollment for their Youth Wrestling Program this Wednesday from 6 to 8 p.m. at Winlock Miller Elementary School. This year the program is part of the Twin City Wrestling Club, so those seeking involvement must purchase a 2014-2015 USAW Folkstyle card beforehand, available for $15 at www.washingtonstatewrestling.com. The cost to register for the league is also $15, meaning the total cost to participate in the program is $30. The 10th annual Ryderwood Arts & Crafts Fair saw a record turnout of vendors last weekend as the seasonal event continues to grow in regional popularity. Organizers reported 41 vendors had participated last Friday and Saturday, twice as many as had signed up five years ago, with handmade items from decorations to greeting cards to musical instruments and more. I'm pretty sure I've never seen so many folks in town as there was this past weekend. The Craft Fair over-flowed into the foyer with vendors and the selection was over the top. Thank you, artists and crafters, for making the event such a success. The Quilt Show was a beautiful touch and the selection was fantastic. Thanks to everyone who contributed so much to the weekend, not the least of who was the crew that served lunch both days. The Red Hat Ladies have an Outing scheduled for this Thursday, though I haven't heard what the destination will be. Call Michele at (360) 295-0899 for info. All ladies are invited to deck out in the red and purple for an afternoon of "all play and no work". Wednesday Story Time with Roxie 10:30 a.m. featuring Halloween Theme at Toledo Community Library. Visit www.facebook.com/FriendsToledoTimberlandLibrary or call (360) 864-6757. Wednesday Cowlitz Prairie Grange Booster Night provides burgers, dogs & chili 6:30 p.m. Salad and dessert potluck, kids pumpkin decorating, costume contest for all. Find out all the grange has to offer. Next: Friday Jam Night 7 p.m. Performers and supporters welcome. Donations at door. Contact tomboone46@yahoo.com or (360) 262-3696. City Councilman Andy Wilson is still looking for photos of past mayors to help complete a wall of portraits representing the history of the city's leadership. Andy is calling on all residents who may have access to such photos to provide them for display or at least for the purpose of making a copy for the collection. Andy has emphasized how significant the contributions have been of our past mayors and is hoping the display, currently in City Hall, can help these men and women be remembered. If you haven't seen the old Lions Hall building, Judy Costello had been hard at work sprucing it up and has most recently added a vibrant new coat of paint to the exterior. Costello bought the building from the Lions last month and has set to cleaning and updating the building so it can soon be opened again for the benefit of the public. Keep looking for updates in the coming weeks. This Thursday the Olequa Senior Center will be featuring a lunch of Tacos with the works, followed by soup and sandwiches on Monday and spaghetti on Tuesday. These lunches are just $4 and are open to the public, while senior nutrition lunches also take place on Wednesday and Friday for those 60 and older. For more information, including how to help volunteer for these programs, call the center at (360) 785-4325. Many of you may have seen the new location of Brosey's Hardware at 109 Walnut St., just across the street from Winlock Auto Supply. They may have a new location, but continue to offer a wide selection of parts and tools, as well as vehicle licensing services. Drop by and see their new venue between 8 a.m. and 6 p.m. Monday through Saturday, or 9 a.m. to 6 p.m. on Sundays. A grand opening is also expected in the coming days. For more info, call (360) 785-3791. A good way to know/learn about the character of a person is to ask their neighbors. In the recent primary election for Cowlitz County Commissioner in the Silver Lake and Toutle precincts, where both candidates are very well known, voters to Gardner total 489 to Mark Smith, 203; 2.4 to 1.0 for Joe Gardner. I think we all agree that smaller class sizes are a good thing for students and teachers. That being said, I am not sure that Initiative 1351 is the right way to accomplish this. Initiative 1351 does not provide funds in order to accomplish smaller class sizes. Where are the extra classrooms going to come from? This creates an un-funded mandate. Smaller class size can be accomplished through McCleary. We need to keep focused on the legislature continuing to fully fund education through McCleary. What is EMS? EMS stands for Emergency Medical Services and is the response by fire department personnel who are trained to initiate emergency medical care, including CPR, cardiac defibrillation, wound care, splinting, medication administration and patient triage/evaluation. This type of response delivers care to citizens experiencing everything from injuries to strokes to heart attacks to breathing problems. 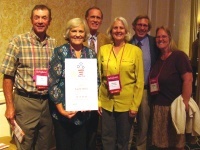 Representatives of the City of Castle Rock accept one of multiple awards garnered during an American in Bloom symposium in Philadelphia the weekend of Oct. 2. During a presentation about the symposium to the Castle Rock City Council on Oct. 13, representatives Nancy Chennault and Dave Vorse (pictured second from left and fifth from left, respectively) reflected on many of the successful beautification projects they witnessed in Philadelphia. Lewis County and Seattle developer Brandon Milton have reached an agreement to seek no further action in a lawsuit filed at the end of last month attempting to block Milton's access to the Vader water system. In the agreement, both parties stipulated they wish to maintain the current status quo, including Milton's lack of access to utilities, and are seeking a resolution out of court amid arguments Milton had attempted to hook into the water system without regulatory approval. General Election ballots have been sent and voters how have until Nov. 4 to return them to a local ballot box or drop them off at the post office. The Winlock City Council has approved the sale of park property north of town to Lewis County for an anticipated expansion project on Highway 603. First approached with an offer from the county back in July, council members approved the sale of 6.07 acres of Winolequa Park for a total of $42,500 during their Oct. 13 meeting, with the funds expected to be deposited in the city's contingency account. It has been noted the property, located between the BNSF railroad tracks and Highway 603, had been undeveloped and contained no park facilities, though it was technically part of the total 36 acres making up the park. If you talk to Castle Rock Head Soccer Coach Brian Ziese, the conversation for Trico League Soccer MVP is moot. He says Rocket senior Jaynie Snaza is a no-brainer for the label. Trico League coaches have to take note. As of this last week, Snaza has scored 21 goals this season, but this is a story about a lot more than a young woman playing soccer. A rundown of recent local games for the week of Oct. 22, 2014. Authorities are seeking help solving a burglary taking place in Centralia back in August. Sometime between 7:30 p.m. Aug. 17 and 11 a.m. Aug. 18, an unknown number of suspects forced their way through the front door of a residence on the 1800 block of Salzer Valley Rd. and stole a Minolta digital camera, a Cannon 35mm camera, a 1940's coin collection, binoculars and various financial documents. The estimated loss is $1,500. Commissioners for Cowlitz County Fire District 6, in Castle Rock, have agreed on the language of a letter to Cowlitz County Fire District 3, in Toutle, stating District 3 must begin paying for ambulance services by Nov. 1. The letter, approved unanimously by the commission, insists on a charge of $380 per dispatch to cover expenses incurred by District 6 during responses, rather than the historical practice of providing ambulance transportation to District 3 without charge. Local EMS and fire calls between Oct. 13 and 19. Two warrants and two sentences were issued by Judge Steven Buzzard during Winlock Municipal Court on Thursday.